For folks of my generation, we best know The Fugitive as the 1993 Oscar-nominated Harrison Ford flick. Oh, we’re well aware that they based the movie on the Sixties TV series of the same name, but most of us never saw it. Because of that, the DVD release of the original Fugitive series piqued my interest. It’s one thing to tell a two-hour tale about the subject, but it’s another to stretch it into the many episodes of a running TV series. I was curious to get a look at the original material. So here I am with a set called The Fugitive: Season One, Volume One. As that title implies, we don’t get all 30 episodes of the series’ first year. Instead, this collection packages the first 15 shows, which is exactly half of the opening season’s run. I’ll look at these programs in order. The plot synopses come straight from the DVD’s packaging. 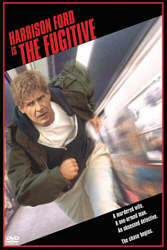 Unlike the movie, The Fugitive has no “origin episode”. It tells us the basics in the opening credits. Dr. Richard Kimble gets sentenced to death for his wife’s murder. However, he didn’t do it, and he claims a “One-Armed Man” was responsible. While Lt. Phil Gerard takes him to prison, their train crashes and Kimble escapes. Thus the doctor becomes the titular fugitive. The series follows his adventures as he attempts to stay ahead of the law – and maybe clear his name as well. 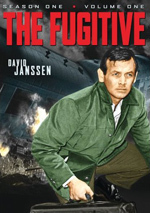 Those who enter The Fugitive the TV series and expect the action of The Fugitive the movie will leave disappointed. I don’t know how much excitement to expect in future episodes, but I anticipate that much of the show will follow the same lines as this one: more of a character drama with romantic overtones. Actually, “City” balances the pursuit side of things with this self-contained character story. Yeah, the drama dominates, but it makes sure we remember Kimble’s precarious status as a free man. “City” tends to be more than a little melodramatic at times, but it starts the series in a reasonably interesting fashion and makes me curious to see where things go. It’ll be hard to beat the episode’s excellent supporting cast, though; I wouldn’t expect to see names like Miles and Keith in this capacity. What an odd story – and a strange choice for the series’ second episode. Jenny is a seriously irritating little character and a weird focus for a program. As its overall concern, the show presents an interesting look at small-town intolerance and such, but Jenny’s consultations with a spooky doll add a bizarre overtone. That contributes to the program’s weirdness and makes it less enjoyable. Part of the problem simply stems from the annoying nature of Jenny. Granted, she’s supposed to be unlikable, but Gillespie does too well in that regard; she renders her scenes tough to take. This isn’t a bad episode, really, but it’s not one that does much for me. Celebrity look-alike BTW: am I the only one who thinks that one of the posse who track Kimble looks a spooky amount like Gary Busey? This guy bears such a strong resemblance to Busey that I’m not convinced it isn’t him. Unfortunately, I can find no evidence that Busey played the role; his first credit isn’t until 1971, so it seems unlikely that he popped up eight years earlier, got no credit for the part, and then didn’t work for almost a decade. The guy sure looks like Busey, though! Will every episode of The Fugitive pit Kimble against bullying louts? So far that’s the trend – one that I hope the series soon bucks, as it’s getting tedious already. How many shots of Kimble as he tries to escape from dimwitted rednecks can we take? On the positive side, we get to see a very young Bruce Dern as a deputy, and the program focuses more on Kimble’s legal status than “The Witch”. I like that side of the series and it’s good for it to refresh after the Girard-free “Witch”. 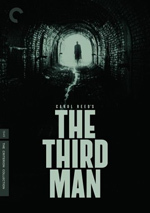 After the opening scene, this one picks up and becomes pretty good. Trivia note: via Dennis, “Mountain” features the very first Oscar-winning Fugitive guest star. Dennis hadn’t earned her prize yet, though; she’d have to wait a few more years until 1966’s Who’s Afraid of Virginia Woolf? snagged her the trophy. Speaking of Dennis, is it just me or does she look pregnant here? She wears a very large shirt the whole show, but it appears that her belly protrudes. I found no evidence that she ever had kids, so maybe she wasn’t pregnant, but she looks strange. I’ll save my thoughts about this episode for my discussion of its second part. Okay, I’m really getting sick of Kimble’s Babe of the Week. Four episodes, four women who fall madly for the mystery man. Gimme a break! Despite the tedium of those elements, “Wave” offers arguably the best episode to date. It starts slowly, unfortunately, as the first half of Pt. 1 tends to drag. However, it soon improves, especially when Gerard spies Kimble at the police department. That’s a scene that the movie pretty obviously emulated, and it works really well here, too. From that point through most of Pt. 2, “Wave” keeps us involved and excited. Other than the slow start and the redundancy of the love angle, this one’s terrific. More trivia: Duvall gives us our second Oscar winner, though he’d have to wait even longer than Dennis to get his award; Duvall didn’t take home the trophy until 1984. He deserves no prizes for his odd turn as a Norwegian snitch, but it’s cool to see him. Oh, and Star Trek fans will recognize Susan Oliver. She played Vina in the series’ pilot episode, “The Cage”. Miracle of miracles – an episode with no romantic interest for Kimble! Lord, they could get away with any idiocy here and I’d enjoy it just for that change of pace. Happily, “Ring” actually fares pretty well on its own. It offers a minor slip into racial issues but unlike most “progressive” programs from this one’s era, it doesn’t beat us over the head with its notions. Instead, it treats the black boxer who wants to be a doctor with surprising racial neutrality. It’s an unusual story and a good one. Casting note: “Ring” offers another killer crew. Not only do we get the accomplished professional Edwards, but also the legendary Ruby Dee shows up as the boxer’s wife. It’s amazing how much famous talent showed up for this series – look at all the big names we’ve already found and we’re not even a quarter of the way though Season One! A second consecutive episode with no Kimble love interest? I’m slack-jawed with disbelief. I did wonder if the attractive nurse would get things hopping with our fugitive, but nope. He stayed romance-free for this show. Unfortunately, the episode was also more entertainment-free than usual. Kimble often feels like a guest star as we deal with the lives of the pregnant worker and her husband. I will give the show some credit for the fact it seems timely 44 years after its creation; with all the debate about illegal immigrants, this one musters modern resonance. It’s just not a terribly interesting show, though at least it brings back a little more drama with Gerard. “Name” guest star alert: Alejandro Rey shows up as the pregnant worker’s husband. No, he’s not on the same level as someone like Robert Duvall, of course, but he still enjoyed a long, fruitful career – and demonstrates the amazing depth of casting for The Fugitive. Here’s a twist for you: a pair of fugitives kidnaps the fugitive! That change of pace makes “Die” a fine show, especially since it forces Kimble to pretend to be a criminal. Usually he’s the nice guy who tries to convince people he’s not a murderer, whereas here he basks in feigned crookedness to out-think the baddies. All that and another show without a love interest! Actually, the program sort of tries to have its cake and eat it, too, as there are some odd romantic scenes between Janssen and Vaccaro – another future big-name. However, these subvert the usual formula and prove intriguing. Robinson and Antonio almost mar the show with their overacting, but the show has enough juice to make it a winner. After so many episodes in which Kimble takes on jobs/roles below his true station in life, it’s nice to find a program in which he gets to act like someone educated and sophisticated. Too bad he doesn’t get that freedom in a more interesting episode. “Alaska” becomes a pretty pedestrian murder mystery without a lot of intrigue. It’s not bad, but it’s one of the lesser episodes to date. And here’s where The Fugitive enters Afterschool Special territory. We learn that fat, stupid guys are people too. Funny how the boxing episode was progressive but this one’s so politically incorrect. At least it brings back Gerard and resumes the chase to a decent degree. While “Nightmare” doesn’t reinvent any Fugitive wheels, it does prove particularly effective. Yes, it revisits some common themes, but it provides more tension than usual, especially when Gerard actually gets Kimble in jail. We know he’ll escape, so the episode milks the drama to establish how this will occur. There’s more psychological depth there as well, and this turns into a strong show. “Tightrope” turns tables and makes Kimble the pursuer instead of the pursued. This technique doesn’t just operate as a gimmick. Instead, it plays out naturally and brings ethical questions to the forefront. Those elements – along with another famous guest star – form this into a strong show. “Terror” becomes awfully reminiscent of “Fatso”. We get another misunderstood, mentally deficient character abused by sadistic jerks. It’s nice to see Jack Klugman as the supervisor, but I don’t find a lot else here that works for me. 14 shows into the series, we finally get Kimble’s “origin story” on screen. We actually see his wife and the One-Armed Man for the first time, and we follow the particulars of his escape. Though we probably should’ve gotten these in the series’ first episode, I suppose it’s better late than never. As a whole, though, “Egypt” is a little lackluster. That’s because it feels like two episode fragments combined into one. The parts with Ruth (Pamela Tiffin) tend to be sort of sappy and moralizing. They don’t go much of anywhere, so “Girl” would’ve worked better as a pure flashback to Kimble’s past. Though this package splits Season One’s episodes in an arbitrary manner, “Hunted” actually makes a good conclusion for the set. A show in which Kimble comes home feels like a natural break, coincidental though it may be. “Hunted” definitely finishes Volume One well. Ala “Little Egypt”, this one provides good background information about Kimble and fleshes out his tale. It’s especially interesting to see how Kimble’s predicament affects his family. There’s enough quality to make this one a satisfying conclusion to Volume One. Disclaimer about disclaimers: two statements appear on the box of this package. One states that "Music has been changed for this home entertainment version" and the other relates that "Some episodes may be edited from their original network versions". Since I never saw The Fugitive prior to these DVDs, I can’t say what – if any – changes – occur. I wanted to mention the disclaimers, though, so fans can be warned that some alterations may exist. 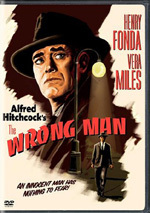 The Fugitive appears in an aspect ratio of 1.33:1 on these single-sided, double-layered DVDs; due to those dimensions, the image has not been enhanced for 16X9 televisions. The shows have held up well after the last 44 years, as they came with few problems. As expected from such an old TV series, source flaws were more prominent. Nonetheless, they seemed acceptably subdued. Thin vertical lines periodically popped up – usually on the right side of the screen – and occasional examples of specks, nicks and grit also occurred. What grain I saw was natural and inherent to the material; those elements never seemed heavy. All the defects were surprisingly minor and created few distractions. Blacks were deep and firm, while shadows seemed smooth and clear. Contrast appeared terrific, as the shows exhibited a wonderful black and white tone. I liked the presentation of The Fugitive quite a lot and felt the shows looked very good. DVD One opens with some ads. We get promos for Mission: Impossible and a mix of other CBS TV series on DVD. Unfortunately, that’s it for supplements, as the package includes no other extras. Though the absence of extras disappoints, The Fugitive offers a good experience. The show has its highs and lows but usually keeps our interest and creates a lot of clever tales. Other than the lack of supplements, Volume One of The Fugitive’s first season works well on DVD. Picture quality seems strong, and audio is more than adequate. This is a quality series that deserves your attention.